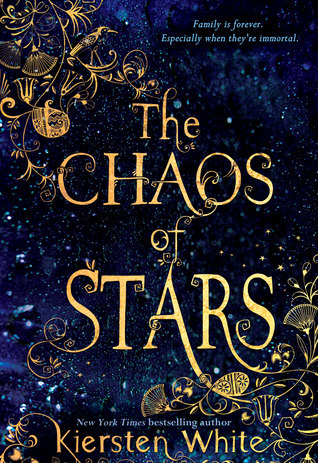 The Chaos of Stars by Kiersten White is a YA novel that ties together contemporary romance with Egyptian mythology. White's usual engaging writing style means it's a quick and easy read. I read it in two hours, and thoroughly enjoyed it. Overall, the first word that came to mind when I finished reading was delightful. The fun and ease of the read is the reasons I gave it 4 out of 5 stars on Goodreads. Physically, the book is beautiful. It is nice having it sitting on my bookshelf. Without the lovely cover and pages, the easy, readable layout, and the pleasant experience of holding the book in my hands, I probably would have just stuck to the library. The Chaos of Stars is a cute and entertaining story that doesn't over-reach itself. It sets out to tell a contained story, in which a girl whose parents are Egyptian gods must come to terms with her own mortality and, in typical come-of-age style, learn to deal with relationships. The plot was interesting, and followed through well, with nice set up and hints. I particularly enjoyed figuring out about Ry. The protagonist, Isadora, has some frustrating moments, but this felt realistic given her age. She didn't feel completely relatable but this didn't seem to impact on my enjoyment of the story. She did have endearing moments and is fabulously sarcastic. The characters who were regular people were beautifully normal and their engagement in the story was refreshing, and helped ease the irritation of the 'impossibly beautiful' trope of YA main characters. In this case it seemed to fit with the mythology interplay. I enjoyed the glimpses into what Isadora sees when she is picturing a room (for her interior design hobby), without going overboard on the descriptors. It felt natural. The juxtaposition between her dreams, recounting the myths and the narrative worked really well, it was easy to follow what was happening, without totally giving away all plot twists. I found Ry somewhat irritating, his persistence bordered on being disrespectful of Isadora's decisions which is not romantic, but it wasn't as bad as a lot of other examples and Isadora held her own reasonable well. Well worth reading at some point, if only for Kiersten White's loveable writing style.